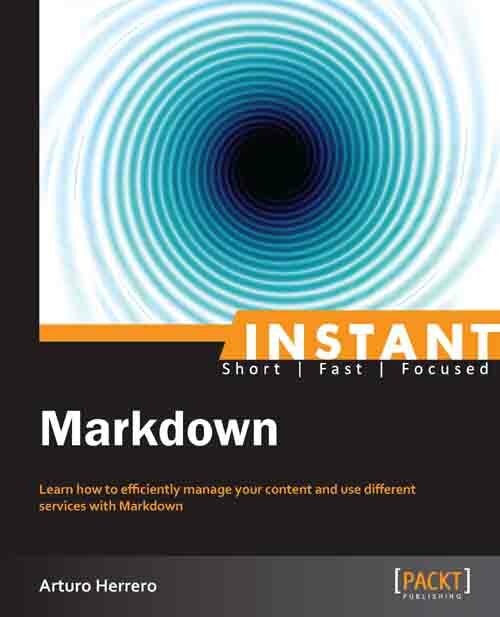 I got an opportunity to do the technical review of Instant Markdown book written by Arturo Herrero. The book is divided in three parts. First part is about Markdown to HTML processor installation. You can skip it if you won’t generate HTML from manually. Second part contains the complete language reference in case you want have it at your fingertips. What I miss from this part are examples with a side-by-side comparison of Markdown markup – generated HTML – rendered document, like in many desktop Markdown editors. You would get better grasp of the relationship between Markdown syntax, resulting HTML tags and visual representation of the document. I enjoyed the third part the most. It tells you about cool applications of Markdown. I already knew GitHub, its comments and readme pages. But there are other useful online services when you can use Markdown to write and publish blog posts and documents. In short, it is a quick but entertaining reading, like any book from the Instant series. On less that 50 pages, you get a complete Markdown syntax reference and some useful hints.